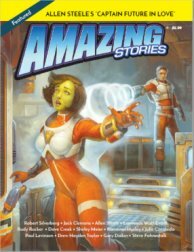 “Harry’s Toaster” is in the first issue of the revived Amazing; I believe it’s just out, but I haven’t yet seen a copy. 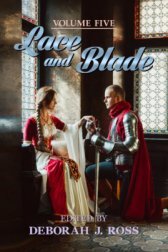 “An Interrupted Betrothal” was delivered to Lace and Blade Vol. 5, accepted, and paid for, and I’ve corrected the proofs. It’ll be out on Valentine’s Day, 2019. I sold “How I Found Harry’s All-Night Hamburgers” to Asimov’s; proofs have come and gone, and it’ll be in the March/April 2019 issue. I have delivered a short story called “Valedictory” (title still subject to change) to an anthology called Release the Virgins. They haven’t read it yet. I have not done any novel-writing in months until today. We were getting our house ready to sell, which meant clearing up nine years of accumulated clutter, selling off surplus furniture, putting half my library in storage, etc. That did not leave much writing time. The house hasn’t sold yet. 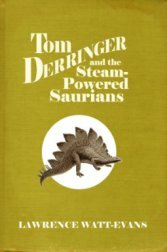 I did finally get back to work on Tom Derringer and the Steam-Powered Saurians today, as explained in the previous post. Posted on August 31, 2018 by Lawrence Watt-Evans in Status Report. Status Report: Lots going on! 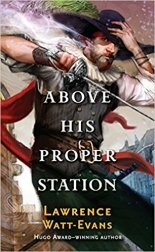 Above His Proper Station is now out in paperback, from Tor — but I haven’t actually seen a copy yet. I’m supposed to get a box of ’em, but it hasn’t yet arrived. 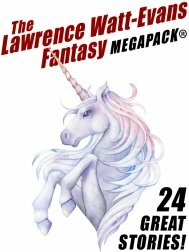 The Lawrence Watt-Evans Fantasy Megapack is scheduled for Monday, March 27. The novel I’ve always referred to by the name of the protagonist, Bravo Foxtrot, was delivered and paid for in January. I have no idea what the eventual title will be, or when (or if!) it will be published. It’s a game tie-in, so I don’t think it’ll be out until the game is, and last I heard that was still some time away. Stone Unturned, referred to for years as “the Big Fat Ethshar novel,” is complete at 140,000 words and sold to Wildside. The contracts are signed and countersigned. The actual text hasn’t been delivered yet because Wildside was backlogged and asked me to hold off, but I’ll be sending it Monday or Tuesday. 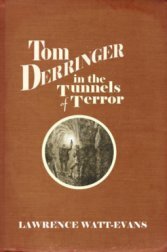 Tom Derringer in the Tunnels of Terror, the second Tom Derringer novel, is finished at 72,000 words and has been sent to the editor, who says she should have her work on it done around the end of April. I’ll be self-publishing this one (and the entire Tom Derringer series) through Misenchanted Press. 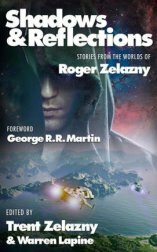 My short story, “The Lady of Shadow Guard,” will be in the Roger Zelazny tribute anthology Shadows and Reflections, edited by Trent Zelazny & Warren Lapine; the book is tentatively scheduled for June of this year. And “The Prisoner of Shalott” will be in By the Light of Camelot, an Arthurian anthology scheduled for August 2018. The next Ethshar novel will probably be Charming Sharra (formerly Sharra the Petty); I’m several pages into writing it. I haven’t yet worked out the entire ending, so it’s possible it’ll bog down, or it may not reach novel length, but right now I expect it to be a short novel like The Sorcerer’s Widow. I have two pending anthology invitations. I’m working on a story called “Double Agent” aimed at one with an April 30 deadline, and a story called “The Dancing Teacher” aimed at one with a June 1 deadline. Since we’re planning to move in a couple of years, I’ve also been putting some effort into finding somewhere I could donate all my professional papers. I think I’ve found a suitable university library, but until it’s official I prefer not to be more specific than that. And finally, my agent has a proposal of mine for a science fiction novel that we’re hoping will interest Tor. So I’m keeping busy, and there’s definitely stuff on the way. Posted on March 25, 2017 by Lawrence Watt-Evans in Status Report, Tom Derringer. Ignore that last post. I managed to retrieve all the old posts and comments after all. Posted on February 1, 2017 by Lawrence Watt-Evans in Status Report, The Basics. I messed up the transfer to my new webhost. I still have all the data from the old Serial Box, but not in an easy-to-import form, and the more I thought about it, the less I saw any reason to keep it. All those serials are finished. So here we have a new, unsullied blog, to do with as I please, and I learned from the experience so that when I switch my last domain over to the new host, I know how to bring all the old posts from that blog with me. Now, if anyone wants me to make a serious effort to recover the old stuff, I can try, but for now I’m fine with starting fresh. Okay, first let me emphasize that I am not announcing a new serial; in fact, part of this post explains one major reason I’m not going to serialize Stone Unturned. (The other major reason is that the last couple of serials didn’t do that well.) But I thought this might still be of interest to folks here, so I’ve ported it over (somewhat edited) from the discussion area of my webpage. First, for those who have missed it, Stone Unturned is intended to be a Big Fat Ethshar Novel combining several old ideas, as explained here. As it presently stands, it has three viewpoint characters — Morvash of the Shadows, Darissa the Witch’s Apprentice, and Hakin of the Hundred-Foot Field — who appear in separate chapters, in rotation. In theory, their stories will merge about halfway through the novel. I thought Ethshar fans might want to know how it’s going, and might be pleased to see a familiar name or two. And I thought that some folks might find the insight into my writing process interesting. Current page count for Stone Unturned: 68, not counting front matter. Estimated final page count: 500? This got complicated. Last Friday we had a day out with friends that involved getting me up earlier than usual, then driving for an hour or so. I don’t drive first thing in the morning; it’s not safe. I’m not awake when I first get out of bed. Julie drove, and I was a passenger. Which is a great situation for working out plot problems, so I did. In fact, I worked out pretty much all the remaining plot of Stone Unturned. Stuff that had eluded me for years all fell into place. I’d worked out some stuff earlier in the week, too, when writing Morvash’s chat with Ithinia — for the first time I looked at the situation from Ithinia’s viewpoint instead of Morvash’s, and realized a few important things. (Morvash is the protagonist of Stone Unturned, and Ithinia has appeared in a couple of previous books.) That probably helped, as I was telling Julie about it in the car. Anyway, on Friday I figured out what the villain’s up to, how he’s stopped, how our heroes clean up the resulting mess, how Hakin and Karitha and Tarker (characters Morvash is completely unaware of at the start of the story) fit into the main plot, what Morvash does, what Pender does, how it all ties back to The Vondish Ambassador and The Spell of the Black Dagger, everything. Except how Darissa and Marek (other characters I’d intended to be important) contribute anything, or why they’d even go after the villain with the others. They fit into the story up to a point, and serve an important role, but then they have their own story after that, and wouldn’t go along with the others beyond that point. So I’m now wondering whether The Petrified Prince should be spun off into a separate short novel. That would remove Chapter Two and Chapter Five from what I’ve written so far, and what I’ve been calling Chapter Seven would really be Chapter Five. If I do split it off, it’s a good thing I wasn’t serializing this — donors would be understandably pissed if two paid-for chapters disappeared. Which is part of why I’m not serializing it; I thought something like this might happen. In another possible complication, I think the stuff I wanted to include from the proposed novel A Slave of Wizardry may not fit very well after all. It doesn’t contradict anything or mess up the plot, but it doesn’t really suit Morvash’s personality. Added 6/2/15: Though thinking about it further, maybe I can split the original wizard character between Morvash and his uncle Gror, whose personality does fit the story. So that’s all complicated, but interesting. I can go ahead and write the story now, and then figure out what stays in it and what doesn’t as I go. And then I got back to work on Chapter Seven (or Five), and it occurred to me to see whether a description matched what I’d said in The Vondish Ambassador. It didn’t. Not even close. I’d completely misremembered. So I had to go back and rewrite the last three pages of Chapter Four (or Three) — didn’t really add or subtract any wordage to speak of, but revised it drastically. Interestingly, this fix also serves to foreshadow some of that plot stuff I’d worked out on Friday. And then I revised a chunk of Chapter Seven (or Five) because I had shown Morvash saying things he has no reason to say. I kept going, and added one page on top of all the revision. I also see where I’m going to re-incorporate the remaining false start (there were originally three of them) I made when I first started the novel — in fact, it’ll probably be incorporated into the second half of Chapter Seven (or Five). So the page-count only went up by one, but I feel I’ve been pretty productive, all the same. The current word-count, not including the lost pages*, notes, front matter, and the remaining false start, but assuming I don’t split out The Petrified Prince, is 17,366. * I lost several pages — about eight, I think — early this year, when a file disappeared, apparently accidentally deleted. Posted on June 2, 2015 by Lawrence Watt-Evans in Progress Reports, Status Report.